A solid email marketing strategy can make all the difference in your organization’s communication plan. In order to stand out from the crowd and reach your audience, you need to monitor your email metrics and make key decisions based off of the data. This can directly help foster and grow relationships with your supporters. 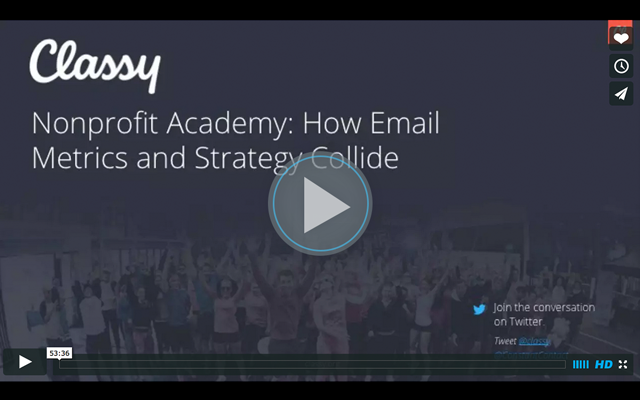 Recently, we hosted a Nonprofit Academy Webinar: How Email Metrics and Strategy Collide. Classy’s marketing team teamed up with Constant Contact to reveal how to manage, grow, and measure an organization’s email marketing strategy. With so much to be said about email best practices, we’ve broken the key webinar takeaways into three blog posts. In this first post, we will discuss key takeaways regarding how to segment your nonprofit emails and measure success. Get the link to the full webinar below. When it comes to email marketing, there is not a one-size fits all audience. Your organization has many different groups of supporters that require different types of messaging. Each donor has a specific connection to your mission, so you need to send them information that is relevant to them. If you don’t, you risk them opting out of your email list. An example of poor email practice recently occurred with one of of Classy’s Marketing Associates. After donating to an organization, she expectedly received a thank you email after her donation. However, two weeks later, she received another email related to a specific event she hadn’t attended. She immediately opted out of their email list. A smart email marketing strategy requires you to send the right content, to the right people, at the right time. Personalization is the key to gaining your supporters’ trust. In order to send relevant emails to each of your supporters, you need to segment your email list. By splitting your email list by different donor criteria, you can send each group of supporters hyper-targeted messages that can elicit action. It’s extremely important to send targeted messages to first-time donors. Reach out in a meaningful way from the start, and you can nurture relationships that will turn these individuals into repeat donors. This is your opportunity to engage them and strengthen their connection to your mission. Your initial message to a new donor should be a sincere thank you. You can include a call to action that gives readers a next step to learn more about your work. You might link them to a relevant blog post that gives them more information about your nonprofit’s mission, or link a video detailing your program’s impact. When drafting your message, ensure your language makes the person feel as though you are in this together. Over time, deliver emails regarding upcoming events, impact updates, or testimonials from beneficiaries. Make sure to ask for a second gift only after you’ve built initial rapport and trust. Monthly recurring donors should receive a personalized thank you each time they donate. You might even mail them a handwritten note to further show your appreciation. To show you set them apart from other donors, deliver monthly impact updates to let them know how their donations are continually driving your organization’s work. Also send personalized emails to show you care about their individual support, like birthday messages or emails marking the anniversary of their first donation. After several months of strengthening these relationships, consider asking donors to increase their monthly gift. To send relevant messages to donors, you need to communicate with them according to the context in which they donated. For instance, you can create a customized email strategy for event registrants. You can then send these supporters targeted emails asking them to attend your next fundraiser. By sending supporters targeted emails, you can build trust and tie different audiences to your mission. This can help increase both gifts and donor retention. Establish target growth metrics for your email marketing strategy. In particular, focus on your open rate and click through rates. A click through rate (CTR) is determined by the percentage of people who open the email and click on at least one link. According to Constant Contact, the average click through rate for nonprofit organizations in any given email campaign is eight percent. Your email layout can also contribute to click through rates. Check that your links are readable, visible, and clear about what you want readers to do next. If your goal is to have the reader donate, place a donate button at the top, middle, and bottom of the email. Do not bury it. These are just a few valuable tips shared in the webinar. Keep an eye out for an upcoming post where we will dive deeper into data-driven communication strategies. In the meantime, check out the the full webinar below.